As if the world wasn’t already addicted to Facebook, the recent IPO hype had all of us in a frenzy. Now that the dust has settled, many are questioning whether advertisers will continue to be tempted by Facebook’s vast network of 900 million users, and whether that crowd control can still allow them to charge higher prices for advertising. But as advertising rates rise, click-through rates have fallen, leaving savvy advertisers anxious to get more bang for their bucks. Though Facebook is seeing 1 trillion page views per month to Google’s 180 billion monthly ad impressions, the click-through rate on Facebook ads is weak even when compared to the internet average, let alone Google’s exceptional figures. The average click-through rate for banner ads in the US is 0.1 percent, but Facebook falls well short of this at 0.051 percent. Google, however, blows the competition out of the water with an average click-through rate of 0.4 percent, almost 10 times that of its social rival. It is therefore no surprise that more and more higher education and language institutions are using Google Ads to promote their programmes. Today we turn to .eduGuru for five key factors contributing to the success or failure of a Google Adwords campaign. The primary targeting tool for Google Adwords are keywords. This is one reason why Google Adwords are more effective than Facebook Ads. The audiences have already pre-qualified themselves for your message by searching for terms like “business degree,” “engineering education,” “Spanish language course,” “study abroad,” etc. Ensuring you select keywords that target the right people looking for your products is critical. Blanketing all related keywords or “spraying & praying” is a poor practice that may generate many clicks and easily spend your ad budget, but will not yield conversions or leads. Take the time to remove all unrelated keywords and focus on specific keywords that will control your ad spend and increase lead generations. Review your site search to see keywords visitors are using to find content on your web site. Use your web analytics software to identify keywords visitors use to find your web site organically through search engines. Use the Google Keywords Tool to identify potential keywords to target. This tool will make recommendations and indicate the global competition and monthly searches using that keyword phrase. Geographic: you can specify your ads to only be displayed to visitors in specific geographic regions. Your ads can also appear to people who have expressed an interest in your geographic region by including geographic terms in their search. For example someone in Boston wouldn’t see your school ad if you were only targeting Miami. But if they searched “schools in Miami” they could see the ad then. Your ad copy is very important. While targeting the right keywords will get your ad in front of prospective students, crafting the right ad copy will motivate them to investigate further and click the ad. Your ad copy, along with your keywords, have a direct influence on your click-through rate. Include keywords: every keyword you target has a quality score. The higher the score, the more often your ad appears and at a lower rate. Include your most important keyword(s) in your ad copy. Value proposition: differentiate your product or service from your competitors. Indicate your unique value to your prospective customer. Test, test, test: create 2-4 variations of your ad and then review performance. Some ads will perform better. You can then make the better performing ad the default ad. All your efforts to date can be easily wasted by directing your prospective students to a web page that is not optimised for lead generation. Simply sending a prospective student to your home page is not good enough (unless the goal of the Google Adwords campaign is only to generate brand/product awareness). Without including a conversion (form completion, PDF download, etc. ), the full benefit of Google Adwords can’t be realised and there is not an easy way to accurately measure success. Most public institutions fail to understand the importance of an optimised landing page, resulting in minimal leads. Take for example the screenshot below. 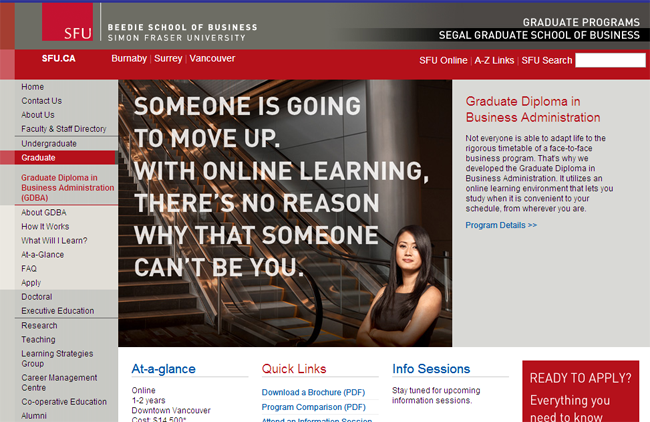 This is the landing page from a Google Ad for Simon Fraser University’s Graduate Business Diploma. This web page is part of their main website and has all the main features include site search, primary/secondary menu links, etc. There are many opportunities for the prospective student to adjust their click-path and end up somewhere not intended and ultimately lose them. There is also no clear call-to-action, no invitation. Keep it simple. Avoid the clutter and distractions of your main web site. Include at least one call-to action. Make it easy and obvious what next step your prospective student should take. Use active language. Your page copy should be in the active voice, encourage participation and instill emotion. Provide a phone number. Not only does this instill trust by allowing the prospective student to talk to a “real” person if they want, but it also provides a way for them to reach out should they be having difficulties completing the form. 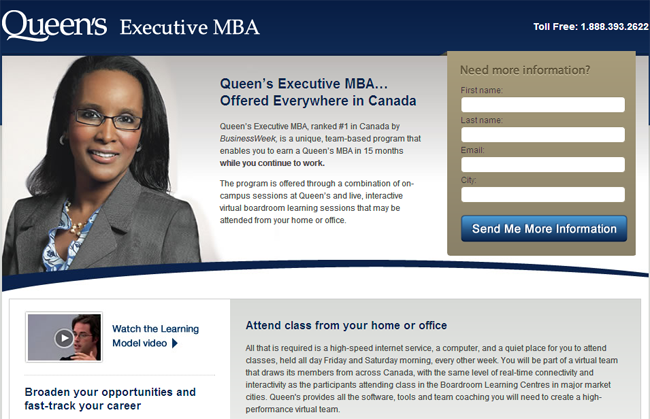 In the screenshot below, you can see a stark contrast between the SFU landing page and the landing page from Queen’s Executive MBA programme. The landing page from Queens’s is simple, to the point and without distractions. It also has a very simple and obvious call-to-action and offers prospective students an opportunity to call directly. It will likely perform better than the SFU landing page, if only for the fact that Queen’s can at least measure results. Impressions and clicks are easily tracked through the Google Adwords programme, but to track conversions, you need to set up a goal in Google Analytics. If you are not tracking conversions with your Google Adwords campaigns, then you are wasting your money and have no way to connect your ad spend to any form of a return. There are many other areas to measure in Google Adwords including keyword performance, ad performance, etc. But at a minimum, you need to be measuring conversions. This entry was posted in Marketing, Most Popular, Technology and tagged study abroad, international students, student recruitment, Most Popular, . Excellent article I learnt much about Google Adwords and will try to put them in practice. It is – in point of fact – a nice and helpful piece of info. I am happy that you simply shared this useful info with us. Please keep us informed like this. Thanks for sharing.